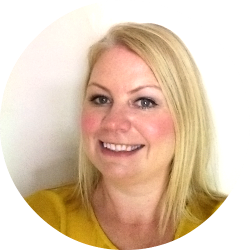 I had my first experience of eyebrow threading at the weekend! And what an experience it was! For anyone that doesn't know how threading works, a cotton thread is pulled along the unwanted hair in a twisting motion to trap hair in a mini lasso and lifts the hair out of the follicle. Apparently it can leave you hair free for up to 6 weeks. I think it's probably better explained with a couple of pictures! It was all a bit spur of the moment! I was in town with my sister on Saturday morning so off we went to the beauty salon taking Oliver, Lydia and my two nieces with us! No appointment was needed and there was no one in, so I got straight in the chair. Well all I can say is OUCH! I think I have quite a high pain threshold (I've had two children naturally with only gas and air!) but it really hurt! I kept telling myself that it just felt like scratching but it actually felt like the hairs were being brutally ripped out...and it felt like it lasted for ages! At least with waxing, it's all over quickly! I'm not sure if I'll have it done again, I might start having them waxed again. At least now I've got beautifully shaped neat eyebrows that look better than they have for a long time! 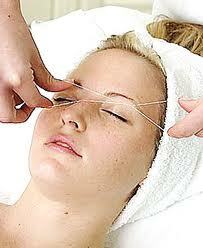 Have you ever tried threading? Do you have it done regularly? This is how I felt! I always get my eyebrows waxed but thoguht I'd try threading. My daughter described it best- it's like pulling a bandaid off slowly!